Home > City News > The Miracalous Shakthi Goddess of Kabbalu Village – Shree Kabbalamma ! The Miracalous Shakthi Goddess of Kabbalu Village – Shree Kabbalamma ! 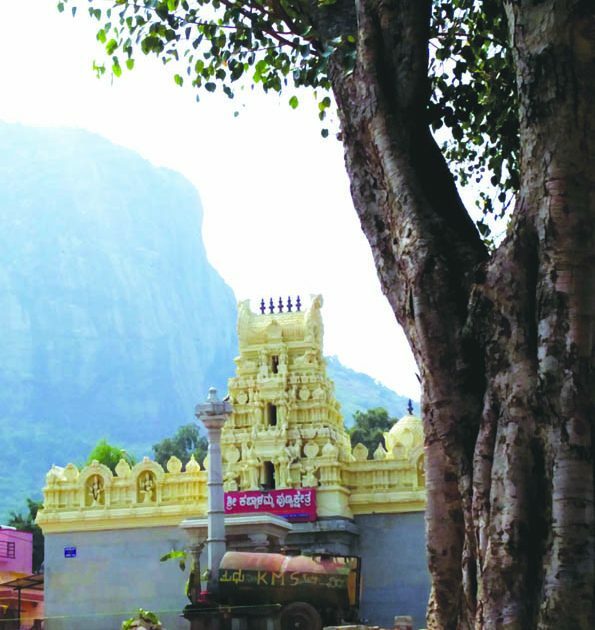 Nested among beautiful natural beauty in the rocky hills of Ramanagar District in Kanakapura Taluk approximately 75 Kms from Bangalore is the famous Shrine of Sree Kabbalamma, the kind goddess – a favourite among politicians and businessmen. 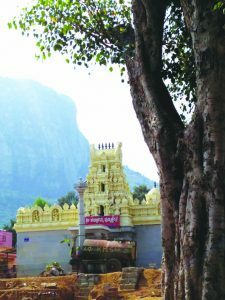 This place can be reached via two roads… One traversing on Bangalore – Mysore Highway 209, going past Ramanagar and at Channapatna turn left and travel 28 Kms to reach the temple. The other way is via Kanakapura road, travel for 16 kilometres beyond Kanakapura till you reach Satanur. At Satanur you need to take a turn, recommend ask around, the friendly locals, these simpletons will guide you to the divine destination. The location is a feast to one’s eyes, natural beauty of spectacular nature – greenery, water bodies rocky hills and good roads. Local public transport is well connected too! Shree Kabbalamma temple has a beautiful backdrop of a 250 Mts hill which is a popular trekking zone. Two trekking routes invites avid trekkers up this hilly climb, one challenging and the other not so challenging. It’s recommended to have one member in the group who’s surveyed the hill before, not finding one take a strong sturdy local one to guide you through. This hill was used by the colonial British to throw convicts off as a punishment to instill fear among the local population, to toe their line of law and order. All convicts suffered a gory death except for one who made a vow that if he survived he would present Shree Kabbalamma a precious golden tiara! Divinity and faith was with him and he survived without a scratch! His story spread; faith, prayers and donations built this temple! This was the only temple for 28 surrounding villages. The miracalous, generous devi has been kind to devotees granting their wishes making her popular. This temple opens its doors early at 6 am and closes as late as 8:30 pm. The temple is built in Dravidian Architecture Style, a beautiful Gopura welcomes you into the shrine. Carry cash and eatables, it’s a one horse town. There’s ample parking space around the temple. Holidays, weekends and auspicious days can see overwhelming crowds out here. Once in a year ‘jatre’ sees uncontrollable crowds here. Devotees keep thronging to this temple repeatedly once to make a wish and next when it’s fulfilled. The temple grounds has an important shrine of a bull or Basava or Nandi as its divinely addressed. Here the first pooja of the day starts with the Basava and then Shree Kabbalamma is addressed. It’s believed the bull sheltered the travelling Devi and she found this place gracious and she settled here. There is a well decorated bull on the temple grounds even to this day. Devotees ritualistically tie currency notes to its horns in anticipation of their wishes to be fulfilled, when their wishes come true they comeback and prostrate at the bull and as a ritual the bull crosses over, this ritual is seen as grace. Even small children do it and till this day. No devotee has been injured. Kabbaladurga is a good day out trekking and divine zone. Local road transportation is aplenty from Kanakapura and Channapatna. Having your own two wheeler or car adds comfort and beauty to your journey allowing in soaking the natural beauty and stopping at picturesque spots. Best season to visit this place from October to February. Avoid trekking in this region during monsoons as the hill gets slippery! A good trek or and a divine intervention awaits you 75 kms away from Bangalore – Kaballapura! To lose weight, count nutrients, not calories ! 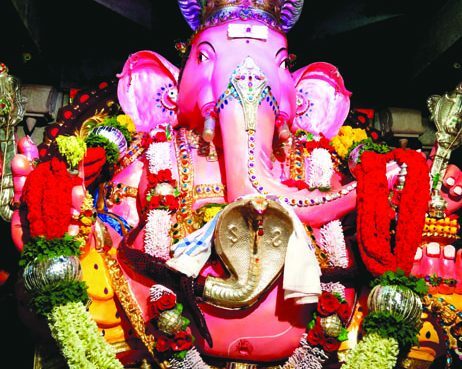 A Temple with no Permanent Diety Gulur Ganesha Temple !